We hope that tagging your status updates and others posts from the Publisher will enable you to share in a more meaningful and engaging way, and connect with even more people. @ tagging has two primary components: 1) your original post has hyperlinks to the profiles/pages that you tagged as shown in the screenshot below, and 2) your post in its entirety also automatically posts onto the wall of whichever friend/page that you tagged. This latter feature has significant etiquette ramifications which I’ll discuss further in this blog post. To make a tag, in the status update field (publisher), type the “@” symbol then begin typing the name of the person/page etc. that you wish to tag. 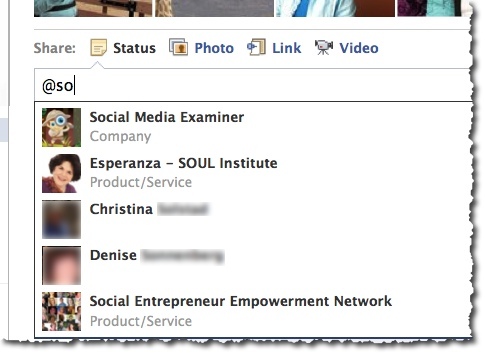 You’ll see a selection of choices in a dropdown menu (see image below) – click on the person/page that you want to tag. The person/page instantly pops into your post, highlighted in gray. Once you publish the post, the name of the person/page turns into a hyperlink. (In the screenshot above, three of the choices in the dropdown menu are fan pages and the other two are friends of mine. I like to blur out last names/photos to protect privacy, just in case their privacy settings are such that only friends know they’re on Facebook). I’m focusing only on friends and fan page @ tags in this blog post. I’ll cover Facebook photo and video tagging in a future post as it’s an equally complex topic! You can have up to six @ tags in a status update — or when posting a photo, link or video — anywhere the publisher appears on Facebook. The publisher is the box where you write a status update or select a photo/link/video). For example, you can make a post on your own wall, friends’ walls, event walls, group walls, and the wall of any fan page, app page or place page you’ve liked. There are many great uses for @ tags. For example, one of the best uses of an @ tag is when you find a piece of content that you’d like to share with your friends/fans – you can copy and paste that content to your own wall and add an @ tag for the originator by way of attribution. This is essentially the Facebook equivalent of a “retweet” on Twitter. Facebook does have the “Share” option below all posts that have a link, photo or video (but not a straight status update). When you use the Share button, it does have a link back to the originator. But the person/page wouldn’t necessarily know you shared their content; letting the originator know you shared their content is part of the relationship-building process. Can you prevent being @ tagged? 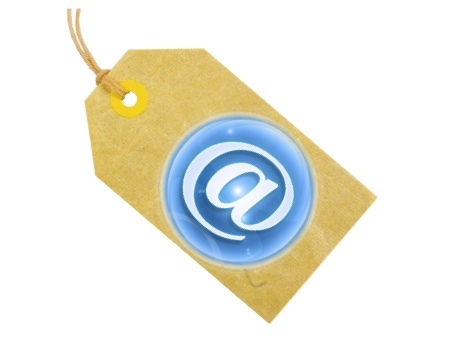 You cannot prevent your profile or page from being tagged. You can remove profile tags, however, which I highly recommend you do any time you feel you have been inappropriately tagged. When your personal profile is @ tagged in a post, there is a little “Remove tag” link below the post. If you remove your tag, your name remains intact, it just won’t be clickable. To acknowledge and give credit. To provide attribution for content you share. To help promote other fan pages. To cross-reference other fan pages, assuming there is no conflict of interests. To @ tag your own page strategically (e.g. by way of a signature when making wall posts). As a way to “poach” fans from other pages that offer the same/similar service as you do to the same/similar target audience. As a way to post your own affiliate link on the wall of the affiliate program owner’s fan page. As a way to get someone’s attention for self-serving reasons. As a way to “imply endorsement” by that person/page. When your post shows up on the tagged person/page’s wall, the only option is to “View Post.” Nobody can like or comment on the post. They have to come back to your original post – whether you made it on your personal profile or fan page. With your personal profile, depending on your privacy settings, nobody can comment/like unless they’re friends with you. Equally, when you @ tag from your fan page, users are “forced” to come visit your fan page if they wish to comment/like the post, but first they have to join (like) your page. Of course, used effectively in a win:win way, this can be a very good thing and it’s how most people use @ tags: as a way to create visibility for yourself on other fan page walls. I will say one of my own frustrations is not being able to comment on a tagged post when the person/page is asking me a question. I would love to see Facebook change this so at least the page being tagged could provide a response. Often, I like to just say thanks! If someone asks me a question by way of an @ tag from their fan page, I will carefully consider whether to join their page to answer the question or not. A workaround is to copy and paste the question with your answer into a Note or as your own status update. There really is a fine art to the practice of tagging other pages from your page. As a great starting point, always ask yourself, “What is my deepest intent?” If you’re truly adding value and helping lift up the other person’s business and fan page, people will feel that positive intent. 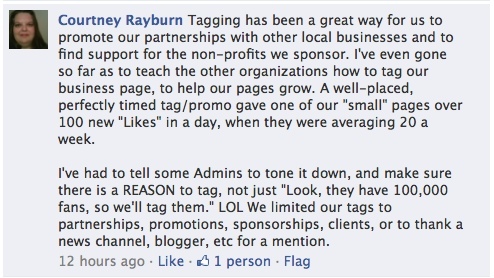 Often, I like to use an @ tag as a way to provide a link to a page of a business I support. But I don’t necessarily need/want to have my post show up on their wall. A way around this is to go ahead and publish the post with the @ tag, then go and remove the post from the other person/page’s wall. In the screenshot below, I wanted to let my friends know about my friend, Gary Ryan Blair’s extraordinary program, the 100 Day Challenge. I promoted the program using my own affiliate link; but I also wanted people to know that Gary has a Facebook fan page for the program too. Immediately after I made this post, I went to the 100 Day Challenge page and deleted my own post. This may not be necessary if a page has their wall set to be posts by page only (fan posts show under a separate filter). I find this practice Alana’s talking about rather inappropriate too. I dislike being tagged when someone has a question for me and in order to answer that question, I have to go to their wall. How have you found success with @ tags? Do you use them much at all – for personal? Or for business? When do you think it’s inappropriate to use @ tags? What is your pet peeve with @ taggers? 😉 Did I miss anything important here? Please share freely in the comments below, and remember I’ll publish a whole separate post on the fine art of photo and video tagging on Facebook!